The Packers Radio Network is a broadcast radio network and the official radio broadcaster of the Green Bay Packers football team. The network's flagship is the E. W. Scripps Company's WTMJ in Milwaukee, Wisconsin, which has broadcast the games since November 24, 1929, and was the former flagship station of Journal Communications until Scripps and Journal completed their broadcast merger and publishing spin-off on April 1, 2015. This is one of the few arrangements where a team's flagship radio station is not based in their home market and the local station serves as a network affiliate only, as WTMJ's signal to Green Bay and most of Wisconsin's population centers is city-grade; the rights for Packers games in the Green Bay area have bounced between Midwest Communications and Cumulus Media throughout the last few years, while stations carrying the games owned by Woodward Communications which nominally serve the Fox Cities exclusively have equally heavy listenership in Green Bay. An internal Part 15 radio station featuring the Packers Radio Network play-by-play, along with public address and scoreboard announcements, serves the area surrounding Lambeau Field during Packers home games to provide the game call to those in attendance without the delay experienced by Scripps uploading the network feed via satellite. The feed is on a non-standard FM frequency which requires purchase of a special radio tuner from the team's pro shop to listen to that signal clearly, though it is audible with cross-channel interference from Wisconsin Public Radio's WPNE at 87.5 FM on regular tuners. The Green Bay stations designated below in the table are considered additional "primary" stations in the network. This designation only truly comes to use in the later stages of the NFL Playoffs if the Packers make it to the NFC Championship Game and the Super Bowl, where those primary stations can carry the Packers Radio Network local call. All other network stations, including those licensed to communities in the Fox Cities, must carry the national Westwood One call instead in line with NFL rules. In situations where Milwaukee Brewers baseball playoff games conflict with Packers games (WTMJ and Scripps also originate that team's broadcasts as the Brewers Radio Network) in September and October, WTMJ's FM sister station WKTI (94.5) originates the games in Milwaukee, with other stations in the Packers Radio Network making their own determinations about carriage of both games depending on whether they have a sister station to broadcast both games. WTMJ is simulcast on HD Radio over WKTI-HD2, in addition to the main AM signal's HD broadcast. Despite the NFL's Game Pass service nominally restricting WTMJ from streaming PRN coverage over the Internet, the station has streamed the team's games since the 2011 season, outside of playoff games, though the streaming has been limited to desktop computers as of the 2015 NFL season due to both the new Game Pass package and TuneIn's premium service holding streaming rights for NFL play-by-play on mobile devices. Its primary programming consists of broadcasts of Packer home and away games to a network of 56 stations in Wisconsin, the U.P., Iowa, Minnesota, North Dakota, and South Dakota, along with a two-hour pre-game show and three-hour postgame show which allows listeners to call, email, or text in a sports talk format about the finished game. Wayne Larrivee has been the play-by-play announcer since 1999, while former Packer center Larry McCarren has worked as the color commentator since 1995. Both Larrivee and McCarren contribute to the team's television programs, in addition to work with WTMJ's television sister station WTMJ-TV in Milwaukee and WGBA-TV in Green Bay, where McCarren was sports director from 2013 until 2015 when he began to focus exclusively on his Packers network duties. Though its broadcasts began in 1929, WTMJ did not begin paying the Packers for broadcast rights until 1943; it paid the team $7500 to broadcast the season. In the early 1930s, there was no exclusive right given to broadcast games, and WHBY, then based in Green Bay, often sent its own announcers to call the game. 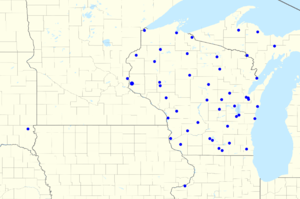 From 1933 to 1936, three additional stations carried WTMJ's radio broadcasts of Packer games: WLBL in Stevens Point, WTAQ in Green Bay and WKBH in La Crosse. WSAW in Wausau and WJMS in Ironwood, Michigan started carrying the feed in 1937. ↑ Gary D'Amato, Irwin closes in on retirement after 30 years, Milwaukee Journal Sentinel, December 13, 1998. 1 2 3 4 "Packers Radio Station Listing". The Official Website of the Green Bay Packers. Retrieved February 20, 2010.